Champion Raceway slots is a very unique three reels five paylines game. It is based on a horse race championship theme. The background of the slot is a race course with sounds of people cheering loudly. It gives you the living racing feel. The game is powered by an actual race track with five horses and riders on them moving towards the finish line. They take one step at a time when a corresponding ribbon symbol appears on a slot. The betting limit is set with the minimum at £0.25 and max at £500 each spin. 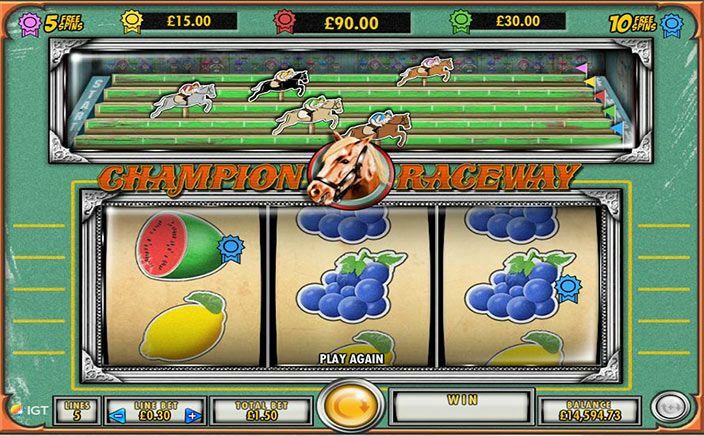 Champion Raceway slots was developed by the IGT gaming company, a top brand in the online casino industry with hundreds of their games already popular among gamblers around the world. They have games in all casino categories and can be played on different devices such as mobile phones, tablets, desktop and laptop computers. These colourful graphics based slot game has some attractive fruity symbols such as watermelons, oranges, apple purple in colour, a bunch of blue grapes and lemon. The watermelon is the top paying symbol where you get 100 times your stakes when three symbols appear on the payline. There are five colours of ribbons; red, green, yellow, blue and pink that appear as overlays on the fruit symbols. Each of these ribbons offers various bonus wins and the corresponding colour horse moves each time the ribbons appear on the slot. The number of each colour ribbons constitutes for the number of steps the horses can take at a time to reach their finish lines. Wild Multiplier: A bouquet of roses is the wild symbol and it covers for all the symbols on the payline except for its own. A single wild multiplies the winning combination by three times, two symbols makes it six times and three of them gives you the 9x multiplier on the payout. Free Spins Bonus: When the pink horse on the race track above Champion Raceway slots reaches the finish line, you get 5 free spins with increasing multipliers of 2 to 10 times while the blue horse gives you 10 free spins with multipliers from 4 to 7 times. These multiplier wins are applicable only during the free games. 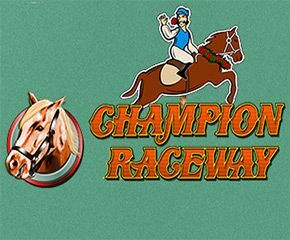 With various bonus features, multipliers, free spins and race track win, Champion Raceway slots is the game that makes winning money an easy deal. A must-try game to all players who play for serious money.